Some days, I think I could live off satays. It’s not everyday I think this, and in fact most days I don’t think about satays at all, but on those days when I do (which coincidentally happen to be the days when I eat them too), I find myself so besotted by them that I think I could really, truly eat nothing else – okay, maybe aside from a little bit of ice cream now and then – and still be happy. The thing is, they’re a near perfect food in every respect. Healthy? Check. Easy to make? Check. Easy on the wallet? Check. Sweet, salty, sour, spicy, crisp, tender and smoky? Check. Utterly addictive to the point of impairing rational thought? Check! Okay, so that last part’s a mixed blessing, but whether they’re Thai, Indonesian, Malaysian or Vietnamese, whether they’re made with beef, chicken, pork, fish or tofu, and whether they’re served with peanut sauce, sambal, nuoc cham, rice, salad, all or none of the above, I know few other foods that give quite as much pleasure in so small a package. As with all foods I really, really love, I keep a mental record of the best I’ve ever eaten. Number one, the satay that set the standard for all to follow, I ate nine years ago on Bali. It was a humid evening in Ubud, and we were meandering around the outskirts of town, doing what we seemed to always be doing on Bali: looking for someplace to eat. It wasn’t dinner time yet, but that didn’t matter – because the food was so cheap, and portions so small, we found ourselves restaurant-hopping throughout the day, stopping in one place for a plate of nasi goreng and another for a peanut-topped salad and an avocado shake. I can’t remember how we stumbled upon this particular restaurant – maybe it was recommended by our dog-eared Lonely Planet or maybe we were lured in by a sign on the street – but upon entering we almost turned on our heels and walked out. It was on the fourth floor of an otherwise empty (and unfinished) concrete building, and consisted of a handful of tables scattered around an open terrace. No kitchen was visible and all the tables were empty, but we had climbed a lot of stairs to get there and the view over a steep jungly ravine was lovely, so we decided to chance it. Then our waitress appeared, an almond-eyed girl of about twelve, probably the daughter of the owners. She beamed as she handed us the menus, and asked shyly, in halting English: “Are you on your honeymoon?” We laughed, and sorry to disappoint her, we told her we were not. “Oh,” she said, looking crestfallen, and retreated to the invisible kitchen with our order of satays and beer. The satays on their menu were expensive by Balinese standards – probably the equivalent of about $2.50. I took that as another bad sign; on Bali, I had learned, cheaper was usually better. But then they arrived, a pile of them mounded on a small metal plate, thin strips of beef threaded onto bamboo skewers like accordions stretched open, lacquered and crisp from the heat of a wood fire, their only accompaniment a small dish of chocolate-colored peanut sauce. And as I bit into the first one, I knew these were no ordinary satays: the beef was expertly cooked, moist and soft in the inner folds, crisp and smoky on the outside. The glaze on them was tangy and spicy and pungent, and the peanut sauce accompanying them was pitch-perfect: creamy, sweet but not overly so, and sour with the dusky bite of tamarind. Each bite brought wave upon wave of different flavors, each of them distinct but all of them in harmony. Clearly, back in that kitchen there was a satay genius at work. Needless to say, we ordered another plate. I wish I could give you a recipe for those satays, but tragically I walked out of there that night without one (though if they ever invent time travel this is one of the first errors I’ll correct). I can, however, give you a consolation prize – the recipe for my number two satays, which I tasted for the first time a few weeks ago, in my very own kitchen. They come from one of the foremost authorities on Indo-Malay food in the US, James Oseland, editor-in-chief of Saveur Magazine and author of one of my favorite cookbooks, Cradle of Flavor. That’s where this recipe comes from, in fact, and I’m kicking myself for not having made it before now. I’ve made a couple of other things from the book which were phenomenal, and I’ve read it hungrily for all his insights into Indonesian, Malaysian and Singaporean cooking, but for some reason I ignored the satays. Perhaps I was afraid my bar was set too high? Well that was pretty short-sighted of me, since comparing the two is like apples to oranges; they’re different, but equally delicious. These satays, from Malaysia, are made with dark-meat chicken, left to bathe for a couple of hours in a fragrant paste of ginger, fennel, coriander and lemongrass. They come off the grill sweetly aromatic, implausibly moist, and imbued with the taste of live fire. The peanut sauce is a work of art too, rustic and pungent and just sweet enough, like a grown-up version of every other peanut sauce you’ve ever eaten. James says the sauce is optional, but as “gilding the lily” is not a phrase in my vocabulary I say it’s not, nor is a simple, sweet-tart salad of carrots, cucumber and shallots. Rice is good too, to give your tongue some relief. And if I can give you one last piece of advice, it’s to memorize this recipe as soon as you can, since once you taste it you’re going to want to make it again and again…and again. Maybe even even to the exclusion of everything else. I know this looks like a looooong recipe, but don’t be afraid. I promise it’s not difficult, nor is really all that time-consuming once you get going. James is just thorough, and wants to make sure you understand the techniques involved, since they might be unfamiliar. To make the marinade, place the coriander and fennel in a small food processor. Pulse until the spices are well ground and dusty. Cut off the top and bottom ends of each lemongrass stalk, which should leave you with pale, white-and-lilac pieces approximately 5 inches (13cm) in length. Discard the tough outer layers and slice the lemongrass pieces as thinly as possible. Add the sliced lemongrass, shallots, garlic, galangal (if using), ginger, turmeric, palm sugar, 2 tablespoons peanut oil and salt to the food processor. Pulse until you have a smooth paste. Make sure that the lemongrass is well pulverized—you don’t want lemongrass bits in the final dish. (If the paste does not puree properly and repeatedly creeps up the side of the food processor instead of grinding, add up to 2 tablespoons of water, 1 tablespoon at a time, periodically turning the processor off and, with a spoon, scraping the unground portions down toward the blade as you go.) Transfer the mixture into a bowl large enough to hold all of the chicken. Rinse out the processor. If using bone-in chicken thighs, remove the skin from each thigh by holding the chicken firmly with one hand and, with the other, slashing and tearing the skin from the flesh with a sharp knife. Cut the meat away from the bone, keeping the meat as whole as possible. (If using skinless, boneless thighs skip the above steps.) Cut the chicken meat into pieces, each about 1 inch (2.5cm) wide and 1/4 to 1/3 inch (6-8mm) thick. Each piece should be about 2 to 3 inches (5-8cm) long. Add the sliced chicken to the bowl and combine it well with the marinade, making sure that every piece is coated. Allow the chicken to marinate at room temperature for 1 to 2 hours. Toss the chicken several times to make sure that the marinade is well dispersed. Make the peanut sauce. Heat a large nonstick skillet over medium heat. Add the peanuts, stirring every few seconds, until they’ve picked up light brown spots, 3 to 6 minutes. Transfer to a bowl and allow to cool completely. Place the peanuts in the food processor and pulse until well ground, but be sure to stop short of making peanut butter. Leave the peanuts in the processor. Place the shrimp paste in the center of a 5-inch (13cm) square of aluminum foil. Fold the edges over to form a small packet, then flatten the whole thing with your hand until it’s 1/4-inch (6mm) thick. Heat a gas burner to medium-low or an electric burner to medium-high. Using a pair of tongs, place the sealed packet directly on the burner, and toast until it begins to smoke and release a burning, shrimpy smell, about 1 1/2 minutes. Turn the packet over and repeat on the other side. Allow to cool. Scrape the toasted shrimp paste, chile, garlic and palm sugar to the peanuts and process until you have a well-ground mixture (again, don’t overprocess – it should look like sand). Transfer the ground ingredients to your skillet and add the coconut milk. Bring everything to a gentle simmer over medium heat. Cook for 5-7 minutes, then add the vinegar, salt and water. The sauce should be the consistency of pea soup. If it’s too thick, add more water, a tablespoon at a time; if it’s too thin, let it continue to simmer a couple more minutes until it thickens. Adjust the salt, then transfer to a bowl to cool. Prepare the lemongrass stalk to use as a basting brush. Cut off the stalk’s hard, brown bottom end and its bristly, greenish top; this should leave you with a piece approximately 8 inches (20cm) long. Discard the tough outer layers, then bruise the thick end of the stalk with a heavy, blunt object, such as the handle of a knife or the bottom of a cup, until it is bristly and “brush”-like. Place the bruised end of the lemongrass in a small bowl along with the peanut oil let sit for at least 10 minutes, so the flavor can permeate the oil. Reserve the oil for basting. Thread the chicken strips onto the presoaked bamboo skewers, weaving the point of each skewer through the center of each piece of chicken every 1/4 inch (6mm) to make sure it holds tight and remains secure as it cooks. Use 1 to 4 pieces of chicken per skewer, depending on how long the pieces are, making sure that the chicken extends from the tip to the middle of the skewer. Leave plenty of room so you can grab the skewer from the bottom end—the chicken should not extend from one end to the other. To cook the chicken on a grill, first prepare a medium-hot wood charcoal fire and oil the grill rack liberally. When the fire is hot, place each skewer on the grill, making sure that the chicken is directly over the heat. Lightly baste the chicken with the lemongrass oil, using the bruised lemongrass as your basting brush. Grill the chicken until it has cooked through and has begun to pick up a few crispy brown-black spots, about 3 to 7 minutes, depending on how hot the fire is. Baste each piece lightly with the lemongrass oil once again. Turn the skewers over. Baste them with the lemongrass oil and continue grilling until the other side is browned, another 3 to 6 minutes. Though you shouldn’t overcook the chicken—it will dry out quickly—it’s equally important that you not undercook it. Test a piece by touching it with your finger. The chicken should be firm, not squishy. Transfer to a serving dish and let the skewers rest for about a minute, until they are cool enough to handle. 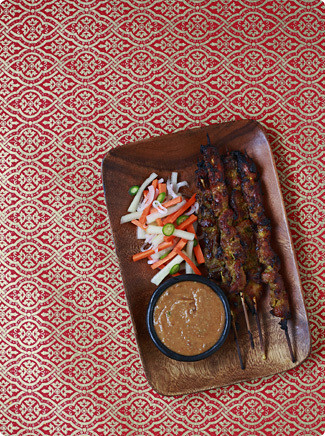 Serve immediately, with the peanut sauce. Yum! I like the sound of your peanut sauce. I bet the shrimp paste adds a lot of depth. These look fantastic! I adore chicken satay, especially with peanut sauce. I love that you use chicken thighs too – so much more flavourful than as my friend’s dad used to call them, chicken chests! I’ve never really thought of satays as very exciting – and now I’m thinking maybe I’ve just never had a proper one. But reading through that post, I feel I must dash off and make that recipe immediately! I’m looking forward to my satay education! i initially was sad to see only one photo of your satays, but as i read on i became immersed in your literary imagery. i felt like i was transported to a sticky, humid bali. thanks for the beautiful story, and recipe. I didn’t think I was hungry until I read this. It’s only 9:30 AM yet I can’t stop thinking about when I could make this!I’ve been getting really into Vietnamese food lately (just picked up "Into the Vietnamese Kitchen" and have made the pork-stuffed tofu and a couple other dishes) and have been wanting to explore the food of Southeast Asia even more. I"ve seen "Cradle of Flavor" online… maybe it’s time to pick it up. Thanks for the post. You make a great point about satays–they really do include the best of all flavors and textures. And I will expound on the joy of satays by pointing out that they can be eaten with one hand while holding a cocktail in the other.It’s official–bananas are no longer the world’s most perfect food! Inspired by this post, I made the satays and peanut sauce today, and dang, they are good. I couldn’t find the dry shrimp paste, but a bit of fish sauce subbed nicely. This recipe is a keeper. I think I could live off these things too!! They are amazing! I was first introduced to them on a trip to Indonesia and loved them ever since! Love the sauce! this dish looks lovely and i really enjoy this site. i noticed you use palm sugar in the sauce recipe. i spent some time in malaysian borneo this past winter and essentially, they are cutting down the entire rainforest for palm sugar and palm oil plantations. the world’s most biodiverse place is being clearcut for plam products. i avoid them, just thought you might want to know. Melissa,…our universes are in perfect harmony! You made Sates, I ate them…. Fantastic! While the ingredient list does indeed look daunting, I feel confident from your pictures and descriptions that this dish is the real deal. I’ve spent a lot of time in Thailand, and am constantly frustrated with the quality of South Asian cuisine in the States. Even in New York, it’s difficult to find a decent and authentic Thai, Vietnamese, or Malaysian restaurant in Manhattan. Usually they lump the three together, which is really a bad sign. Since it’s too much of a pain to haul off to Queens every time I want Massaman curry, I’ve taken to experimenting with these cuisines in my own kitchen. It’s actually quite difficult to find spot on authentic recipes for the most basic Southeast Asian dishes, meaning ones that don’t involve an overload of sugar. I can’t wait to add this to my repetoire. Thank you! Not only does it look amazing, but it also tastes incredible. Love it! Now I will think every day about Satays. They’re a bit addictive, aren’t they? They’re delicoius, healthy and actually inexpensive. Thanks for sharing. I cannot wait to try this recipe! Headed out to buy the ingredients right now! Glad to see you made some satays. I like satays.A. from Malaysia. Satay’s are one of my favourite dishes. I do a mean peanut sauce, if I do say so myself, but I’m going to try this one and see how it compares. Looks great! Satays are the ultimate street food, I missed them so much I prepared a batch for a party recently (http://wp.me/p1BLc-9s), adding more chilies and tamarind water to the peanut sauce in place of coconut milk. It definitely adds a memorable kick! I am a sauce junkie. I collect sauces and their recipes for a living. And this is a sauce I must covet. I live in rural Oregon where ingredients like lemongrass and galangal are things of the imagination–until–friends from the Willamette Valley came to visit last weekend! We made the satays and the peanut sauce and although I used 6 pounds of chicken for the 4 of us (which I thought would yield lots of leftovers) we only had a few skewers left! The leftovers were amazing cold, dipped in the peanut sauce and eaten straight off the skewer. The marinade was so strong when I first processed it that I thought it would be overwhelmingly intense, but it yielded a sweet, delicate flavor that revealed itself differently in each bite. Thank you for challenging me with such a great recipe that was engaging and definitely a crowd pleaser! It looks really tasty. I will try to cook it tonight ! I cooked it yesterday. It was really tasty. Thank you for the receipt !I will try others which were published on the website ! Try to cut small chunk of cucumber, red onion and dip in the peanut sauce. It is how we eat it in Malaysia. Tried this today. It was excellent. Thank you.